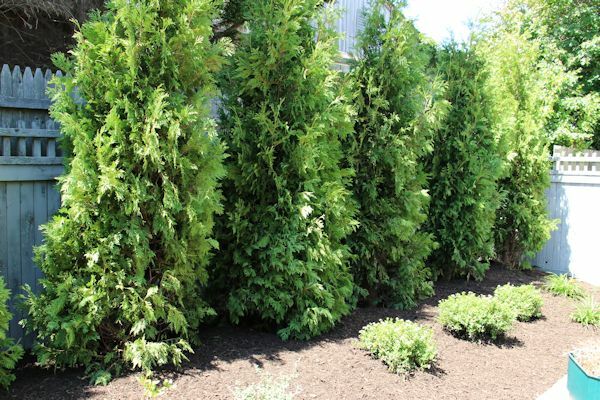 Very often larger landscape trees and shrubs will arrive either wrapped in burlap or burlap encased in wire baskets. These allow the tree to be picked up by the root ball instead of the trunk and are used to protect the roots during transportation and handling. Also, on many occasions large tree spades are used by growers to dig the tree for transportation. These giant spades will cause surrounding soil to be pushed up higher around the trunk way past the flare. 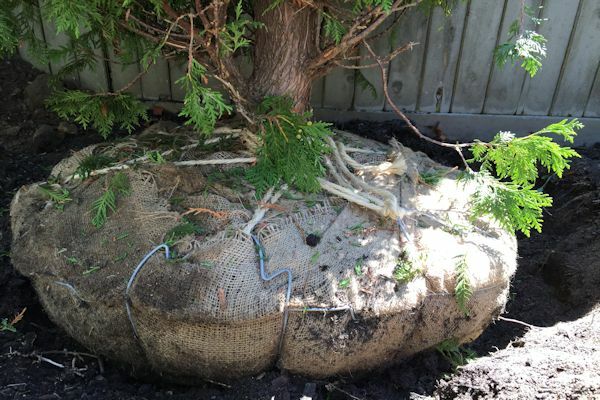 When planting, burlap or wire baskets should be removed completely or pushed down as far as possible below the soil surface to allow for the tree to develop new feeder roots, and the root flare should be visible. Care should be taken both during the arrival and planting of the tree to ensure its survival. Here are some recommendations. 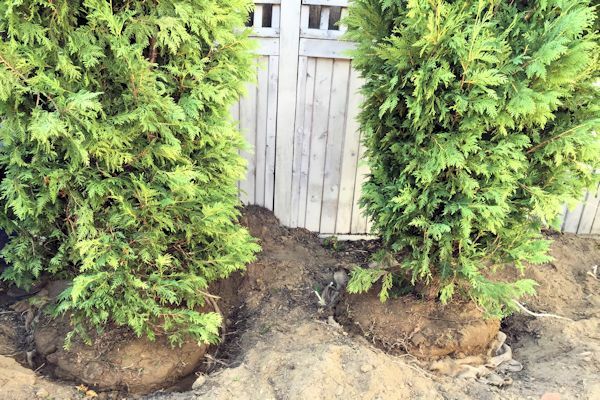 Some horticulturists recommend removing at least the top 12 to 18 inches (two or three levels) of wire from the root ball with larger trees, or the entire basket when possible. (Source: University of Florida Horticultural Department). Dig the hole the tree is being planted in wide enough so that the wire basket can be cut and folded down around the plant. Cut and remove any top burlap and do the same, pushing the burlap as far down as possible (if not removing it completely). It is alright to leave the bottom portion of the burlap or basket intact if the root ball does not appear stable enough to remove it. Wire baskets are known to degrade slowly in soil, and can be intact up to 20 years after planting; however, the welded joints tend to degrade sooner. Natural burlap typically tends to rot in the soil, with the exception of some of the drier parts of the country (regions receiving less than about 20 inches of annual precipitation). Synthetic burlap does not decompose. To distinguish between natural and synthetic burlap burn a small portion with a match. Synthetic burlap has a smoother feel and often smokes and melts. Natural burlap is coarser and usually burns with a flame and turns to ash, while synthetic does not. 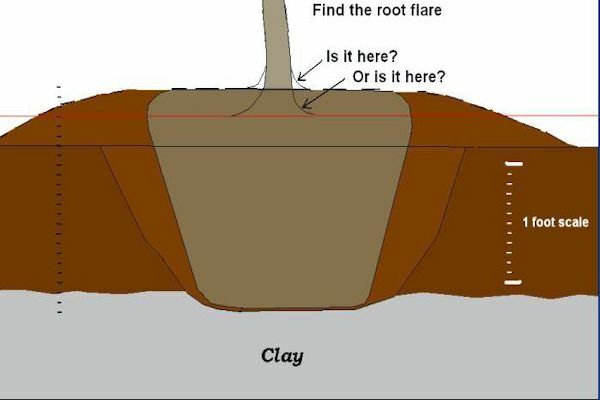 When positioning the tree check for the root flare (see diagram above) and remove any soil that may have been pushed up when digging. The root flare is pointed out as the lower line on the diagram where the trunk gets wider. 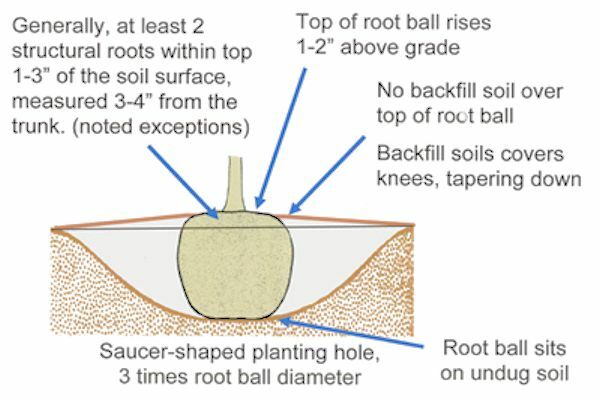 The tree will develop new feeder roots near the top of the root ball enabling the tree to receive water, undergo oxygen exchange and obtain minerals. It is not uncommon to see the tree’s root ball covered with additional soil. If not removed the tree will be buried too deeply and will often send roots growing straight upward where conditions are better. 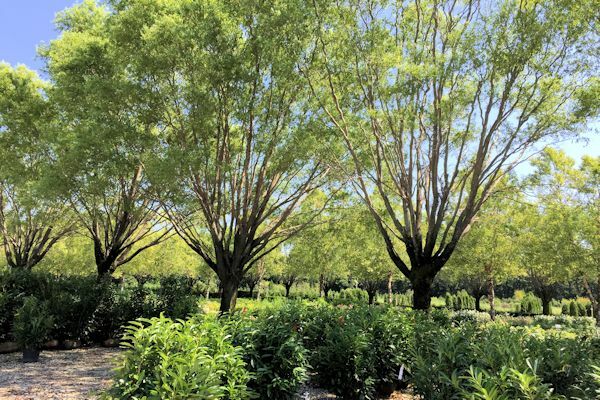 Over time this will cause the tree to stress and slowly suffocate due to a lack of water and oxygen or girdling root (roots wrap around the base of the tree and suffocate it). Now that the burlap and wire are pushed away from the roots it is time to plant. 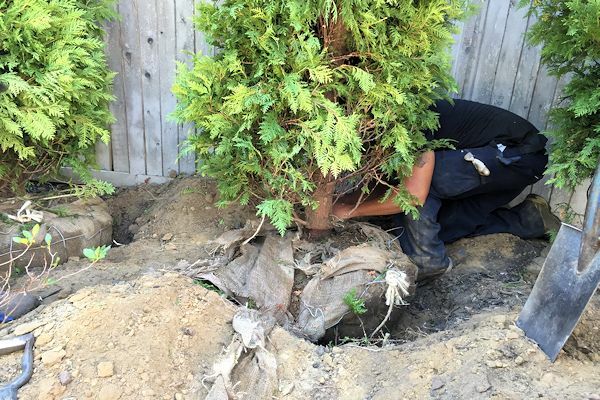 Position the tree slightly above the grade (1-2 inches) to allow for proper drainage and mulching once the tree is planted. This will also ensure proper transportation of water, oxygen and minerals, as discussed above. 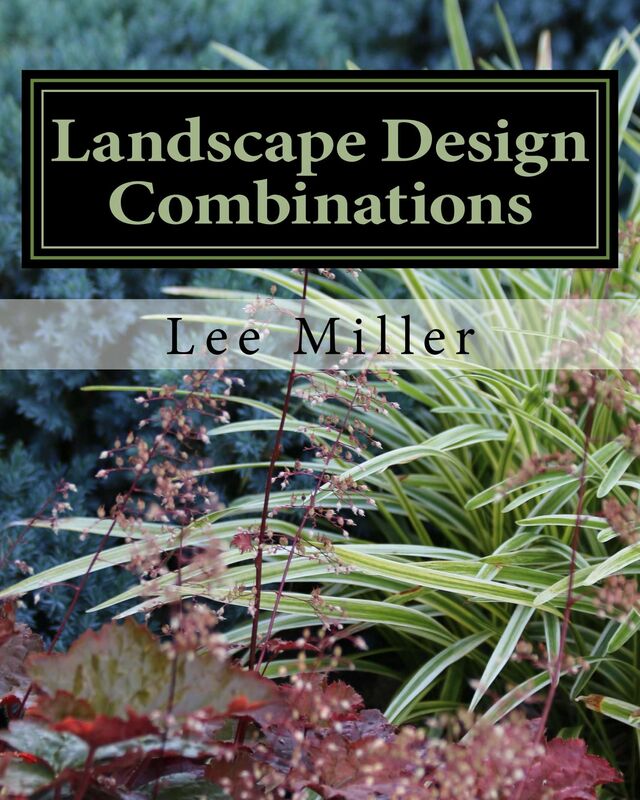 As a general rule of thumb plant one inch above grade for each inch caliper of tree trunk. For example, a tree with a one inch trunk caliper (diameter) should be one inch above grade, and so forth. Now that we have covered the proper techniques it is time to go out into the garden and get some trees planted! 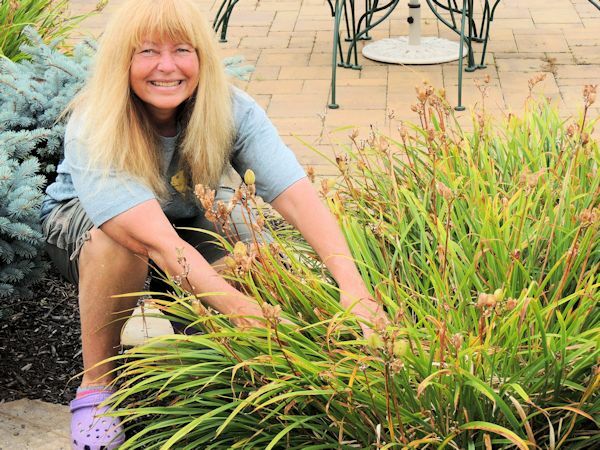 This entry was posted in Evergreen Care, Planting Evergreens, Planting Trees, Proper Planting Techniques and tagged evergreens, gardening, landscaping, planting depth, planting evergreens, planting trees & shrubs, proper planting techniques. Bookmark the permalink.